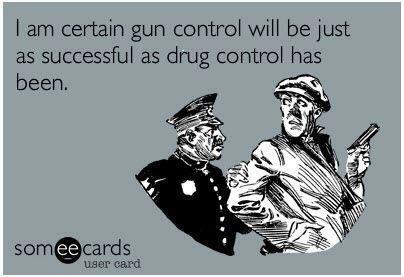 Since I shared a pro-Second Amendment t-shirt the other day, let’s have an encore and enjoy this poster on gun control. But I almost never venture into the abortion debate (the only exceptions being here and here), and I’m not going to change my pattern today. My only point is that the poster is snarky and mocking, which is the type of humor I often enjoy, so I had to share it. We do have a second image, and this one is unambiguously clever and compelling. Very similar message to the first image in this post. And if these two images don’t give you enough anti-gun control humor, feel free to click here, here, here, here, here, here, here, here, here, here, and here. To those who adamantly express your desire for a completely disarmed human race, I say RELAX. It’s only a matter of time till you get your way. After the sufficient number of real and staged “mass shooting” events, the citizens, in a state of fear and exhaustion, will give up their rights (and means) for self-defense. The vast majority of humanity will then be successfully disarmed, leaving the exclusive use of force in the hands of the military, the “enforcers” and the criminal element. Those of us who chose to obey “the law” will then be at the complete mercy of these armed groups. Those groups will then be able to do whatever they wish to the helpless population. And they will. Those deemed useless, rebellious, unattractive, defective, or some sort of “threat” to those in power will then be eliminated. Don’t worry, no one will say: “I told you so” to the “gun control,” advocates. Because most of you will be gone, along with all those now deemed subversive/unnecessary. I’m not saying that, considering the militarization of the police (Backed by the military), that an armed population would have much chance against them in open rebellion, but with a disarmed population, ANY rebellion or protest is no longer an option. Consider very carefully if you choose to give a complete monopoly on the use of force to those who orchestrated 9/11, put the poison Fluoride in your families drinking water and commit endless crimes against humanity and our world. Throughout history, multitudes of disarmed peoples have been led to their deaths by criminal governments. So…to all you supporters of the human disarmament movement, REST EASY! You will be victorious! Those behind the movement are very, very clever. Smarter than you, smarter than me. And when they lead you and yours to death or eternal slavery, be sure to tell your families how well your intentions were. Don’t like abortions? -don’t have one. Don’t like gay marriage? Don’t attend one. There, now wasn’t that easy?